In late afternoon, the sun came out for a few minutes, and the woods burst with the songs of warblers. This male Cape May warbler worked the treetops. Right at the moment that the trees leaf out in spring, and insects wake up and start to eat the leaves, millions of warblers arrive from the south and feast on the tiny critters. 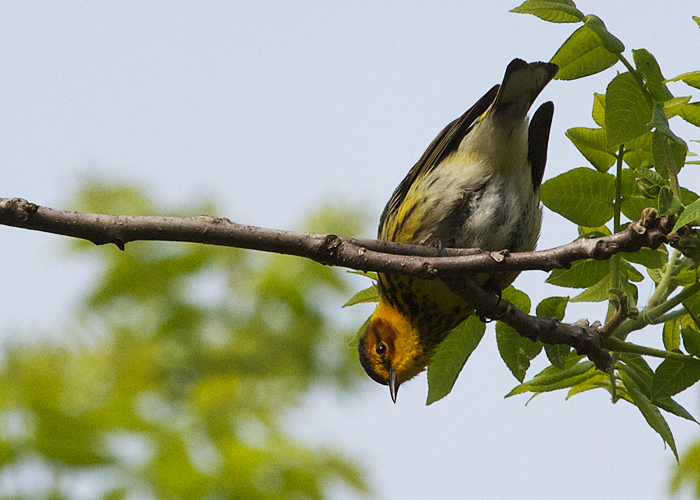 By the time the warblers reach their northern nesting grounds, they've passed through the entire continent, plucking billions of insects from the leaves. Nourishment for warblers. A huge help to the trees! 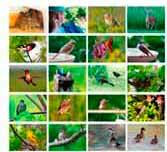 See and hear the most beautiful birds in the world. This DVD has a singing male of every all 39 species of wood warblers found in Eastern North America. A beautiful experience for the eyes and the ears. There's also a version for warblers of Western North America. Everyone interested in watching wild birds deserves her or his very own binoculars. A good binocular for getting started does not have to be expensive, but it should have good optical quality.